It's a bit of a sleepy Sunday; Harvard Square and the surrounding parks are full of people lounging about in the glorious late-October sunshine. Here are some great children's lit articles from all around the internet to enjoy with your Tealuxe (better known at the George as "Tealicious"), or your lazy fall day beverage of choice. - Beacon Street Girls vs. Gossip Girl: Last week, NPR hosted a showdown between creators Addie Swartz and Cecily von Ziegesar regarding girls, reading, and morality. Will girls learn bad behaviors by reading about "bad" girls, and good behaviors by reading about "good" ones? Do the benefits of reading -- anything at all -- outweigh the value of content? And who determines the worth of a book's content? von Ziegesar, Swartz, child development specialist Jeanne Brooks-Gunn, host Tom Ashbrook, and various callers debated these questions for the full hour, and while a Mean Girls-style slap-fight never broke out, there was a lot of very heated discussion. Meanwhile, the New York Times seems to weigh in (no pun intended) on the Beacon Street side, with an article about BSG book Lake Rescue in a study on combating teen obesity. - More bipartisan picture book reviews: In the New York Times, Bruce Handy worries that books like Barack Obama: Son of Promise, Child of Hope and My Dad, John McCain over-idealize candidates for young readers. He also points out that nobody's attempted a Palin picture book biography (yet). - Gaimanfest, part zillion and three: Locus's review of Margo Lanagan's Tender Morsels, an intriguing new YA fantasy, includes a bit about The Graveyard Book. In the best Gaiman description ever, they call Neil "the Boss, the fantasy equivalent of Springsteen." NPR also has a great piece on Mr. G and The Graveyard Book, called "Parenting Neil Gaiman Style: It Takes a 'Graveyard'." 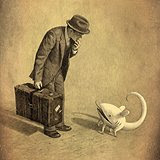 - Up-and-coming author alert: Kelly Link's creepy short story collection Pretty Monsters, with illustrations by the amazing Shaun Tan, is another book on our must-read list. She was recently in Boston on a book tour and did an interview with the Phoenix. - And just for fun, the best books that never were: The Guardian asks, "Which are the best books that never existed?" Some children's lit-related suggestions that came up in Shelf Awareness were The Princess Bride by S. Morgenstern, Inkspell by Fenoglio, and Tom Riddle's diary from Harry Potter and the Chamber of Secrets. What other books do you wish were real? Arthur Spiderwick's Field Guide to the Fantastical World Around You? The Never-Ending Story? The Gossip Girl website? The Marauders' Map? News from the Hut: more in-store events, extended hours, and a celebrity sighting! First things first: in addition to our Halloween costume party this Saturday from 2 to 4 pm, we have two other fun events coming up in the next month! - Join us on Sunday, November 2, from 3-4 pm for a special preview of Emerson College's production of The Hundred Dresses. - On Sunday, November 30, from 10 am to 6:30 pm, silhouette artist Marcella Comerford will return to Curious George to do hand-cut silhouette portraits. Call to make a 10-minute appointment. We've just received our shipment of the first picture book by resident illustrator Julia Denos! Julia's illustrated the early chapter book series Sleepover Squad by P.J. Denton and a nonfiction early reader called Sojourner Truth: Path to Glory by Peter Merchant, as well as doing cover art for the middle grade mystery Marley Z. and the Bloodstained Violin by Jim Fusilli. 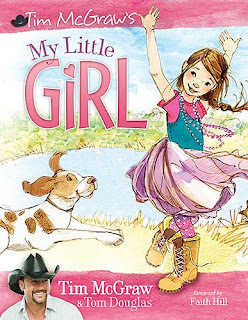 Her first-ever picture book is by none other than country music star Tim McGraw. It's called My Little Girl, inspired by the song of the same name he wrote for the movie Flicka. Check out a virtual galley of My Little Girl at the publisher's website. Julia's blog, with some behind-the-scenes sketches and updates on her ongoing illustration work, is a must-see. Julia is definitely a rising star to watch in children's illustration. We are so proud of her and her accomplishments! ....and now George staffers are coming by and gagging at the sappiness of this post, so let's call it a night, okay? Last year's winner was Sherman Alexie's intense but incredible Absolutely True Diary of a Part-Time Indian (which then went on to win a Boston Globe-Horn Book Award), so we're looking forward to seeing what wins this time around! What: Dress in your festive best to decorate creepy cookies (with a little help from the spectacular Hello, Cupcake! 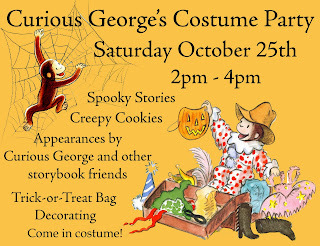 ), make a trick-or-treat bag, hear spooky stories, and hang out with George and his picture book friends! In the deluge of exciting new titles this fall, two dystopian science fiction novels merit a reading-by-flashlight-under-the-covers award. Suzanne Collins, author of the Gregor the Overlander series, kicks off a new series with The Hunger Games, while Allegra Goodman (author of Intuition) ventures into the YA arena with The Other Side of the Island. In addition to rote memorization and copying “education” methods, the Corporation uses “Persuasive Reasoning and Positive Reinforcement” to correct citizens’ “Inaccuracies” and “Unpredictable” behavior. (Do you feel Big Brother watching you yet?) Honor’s family moves to the island after living in the wild Northern Islands, and she desperately wants to blend in and be so perfect no one will notice her misfit, rule-breaking parents. In comparison to the developed setting, Honor herself is surprisingly lackluster, wanting to belong merely to avoid trouble, and barely bats an eye when her former best friend is suddenly orphaned. The pace gradually picks up as her parents escalate their rule-breaking with the birth of a forbidden second child, and soon disappear without explanation. Honor must finally face the possibility that the Enclosure is perhaps not so very safe and secure as she thought. Her turnaround revelation is a long time coming, and not quite as satisfying as I would have liked. The overall background is wonderfully imagined, but where problems like Honor rescuing her mother could have become complicated or emotional, Goodman opts for easy solutions: another grown-up steps in to do the dirty work in places that are “not for children” (pg 263). Let us remember Harry Potter at thirteen: taking on Sirius Black, Azkaban’s first escaped prisoner! While Goodman may not give Honor enough credit, there are still plenty of big ideas to chew on here. The borders of faith and science, environmental guardianship, government, and individualism are probed subtly, leaving room for a reader’s own interpretation, with plenty of action in between. Suzanne Collins gives us a blunter, more brutal world in Panem (once known as North America), reminiscent of Anderson’s Feed and Card’s Ender’s Game. There used to be thirteen Districts surrounding the Capitol, until the thirteenth District was utterly destroyed as an example after a failed rebellion. For further punishment, every year each District must send two young “tributes” (read: child sacrifices) selected by lottery to compete to the death in the televised Hunger Games, mandatory viewing for the rest of the citizenry. Katniss Everdeen hunts illegally in the wild outside District 12’s fence to support her mother and younger sister, Prim, until the unthinkable happens: Prim is selected for this year’s Hunger Games. Katniss volunteers in her place (heart-wrench), only to discover that her counterpart tribute is Peeta Mellark, a boy who once helped her in her family’s darkest hour (more heart-wrench, and the beginnings of a seriously complicated romantic subplot!). After a week of training with their drunkard mentor, Haymitch, the tributes are let loose in the arena. It’s near-constant action from here, with the brawny teaming up on the weak and the Gamemakers spurring on the bloodbath by setting off pre-made traps. You can’t help but root for Katniss, with her perfect mix of wilderness knowledge, courage, and incredible humanity in the face such brutal inhumanity. There is a fair amount of violence – some of it particularly brutal – so those made queasy by blood should be warned. “Katniss, it’s just hunting. You’re the best hunter I know,” says Gale. “It’s not just hunting. They’re armed. They think,” I say. “How different can it be, really?” says Gale grimly. Following in the footsteps of dystopian greats like 1984 and films like Battle Royale, Collins gracefully handles questions of power and humanity, creating a disturbingly possible future. I can’t wait to see how the rest of the series develops! Here are some reading suggestions to give you an introduction to the array of awesome dystopian books out there. In a world where everyone has immediate access to the implanted "feed," living without it is unthinkable. When Titus and Violet meet while recovering from feed malfunction, they challenge the social convention of the feed and discover what it truly means to be an individual. When 17-year-old superhacker Marcus is caught in a terrorist attack, his track record lands him in interrogation with Homeland Security. After his release, Marcus must decide whether to lay low to protect himself or to use his techno know-how to fight for civil rights. Matt is a clone, created to provide replacement body parts for 140-year-old drug lord El Patrón. Unlike most clones, Matt still has his intelligence – and he’ll definitely need it to escape from El Patrón’s estate into the equally dangerous world outside. Twelve-year-old Jonas is nervous, but excited, about his new role in the Community: the Receiver of Memory. What he learns from the Giver will change Jonas's life – and the Community itself – forever. On a futuristic earth where humans are systematically possessed by alien “souls,” protagonist Wanderer discovers what happens when her “host” refuses to relinquish her body or her memories. When the moon shifts dangerously close to Earth, deadly climate changes end modern-day life. Miranda learns about courage, integrity, and loss as she helps her family survive in desert suburbia. Tally can't wait to have the operation that will make her a "pretty" and make over her whole life. Then a terrible secret about the procedure makes Tally question the benevolence of a society in which individuality is considered ugly. Congratulations to the winners and honorees of this year's Boston Globe-Horn Book Awards, which celebrate excellence in picture books, children's fiction and poetry, and children's nonfiction. Speaking of being big geeky fans... Perhaps you, too, wish the incomparable Neil Gaiman were coming to Boston on his Graveyard Book tour. Happily, Mr. Gaiman is doing a video tour, which means he's reading a chapter of the book per stop, sequentially, and then posting the videos on his website. Brilliant, right? Make sure you pick up a copy of The Graveyard Book so you can read along.